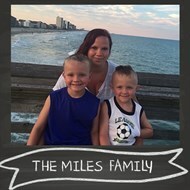 Join Habitat and the Miles Family as they become official Homeowners! Please email habitat@hfhsummitcounty.org for more information on where and when to join us! Mandy grew up in Cuyahoga Falls with her parents and 6 siblings. She has two amazing boys, ages 5 and 7 who keep her busy! They enjoy sports and outdoor activities🏀⚾🏈. The boys have been eager to help do sweat equity hours for their new Habitat Home🏡! They are very excited to be getting their own rooms for the first time. Having this house will give the boys room to grow and help teach them to take pride in their home. Mandy is grateful to have so many family, friends and coworkers around her to help make this house a reality for them. This house will be filled with love and laughter.